September Mourning have been turning heads in the dark art and metal scenes for years, bringing a fusion of dark culture and fantasy based in the world of comic books to life on stage. Created by September Mourning frontwoman Emily Lazar and comic book legend Marc Silvestri, the comics “A Murder of Reapers” and “The Hand of Fate” (collectively “Volume I“, published by Top Cow/Image Comics) tell the tale of September, a human/reaper hybrid with no memory of her past. Empowered with supernatural gifts, she is driven to protect humanity from Fate and his Reapers. This mysterious story – brought to life by September Mourning‘s potent mixture of dark pop, electronica and modern metal – can be experienced in auditory form via their latest Billboard-charting (#19, Heatseekers) Sumerian Records release, Volume II, out now (Amazon | iTunes | Spotify). In late 2018, September Mourning released the singles “Empire“, “Glass Animals” (video below), and the third chapter of their story, “Trinity“. More music will be released in 2019 and “The Complete Collection“, a full graphic novel containing all four chapters of the story, will hit comic stores in early 2019. 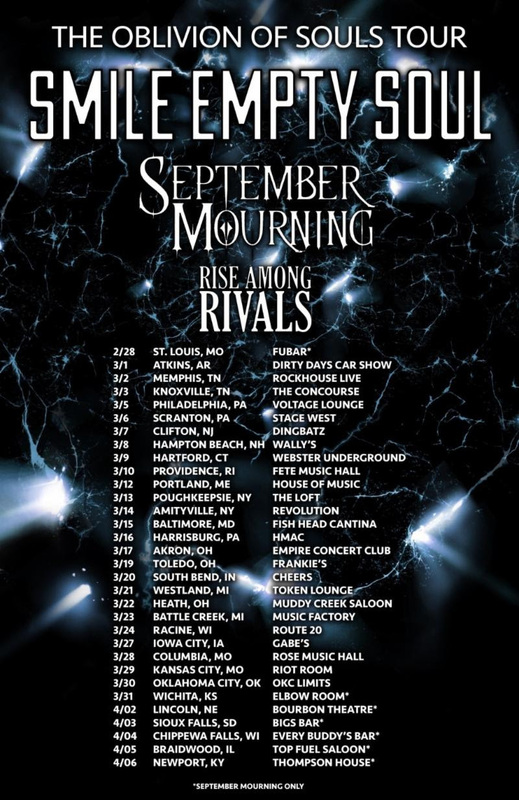 Witness September Mourning on the road this winter during their upcoming tour with headliners Smile Empty Soul and fellow support artist Rise Among Rivals! The tour begins next week on February 28 in St. Louis, MO, and will visit over a month’s-worth of major U.S. cities, coming to an end on April 6 in Newport, KY.
September Mourning are no strangers to the stage, having built up their touring resume by performing at massive events such as Download (UK), Rock on the Range (Columbus, OH), Aftershock (Sacramento, CA), Comicpalooza (Houston, TX), AC Boardwalk Con (Atlantic City, NJ), Anime Midwest (Chicago, IL), Mechacon (New Orleans, LA) and many more. See below for a full listing of tour dates (please note that specific dates notated with an asterisk feature September Mourning only), and pick up tickets via their website HERE. September Mourning are also pleased to announce their recent signing with The Oracle Management. Founded by Dez (DevilDriver, Coal Chamber) and Anahstasia Fafara, The Oracle Management is powered by passion, honesty, integrity and a militant devotion to the creative arts. 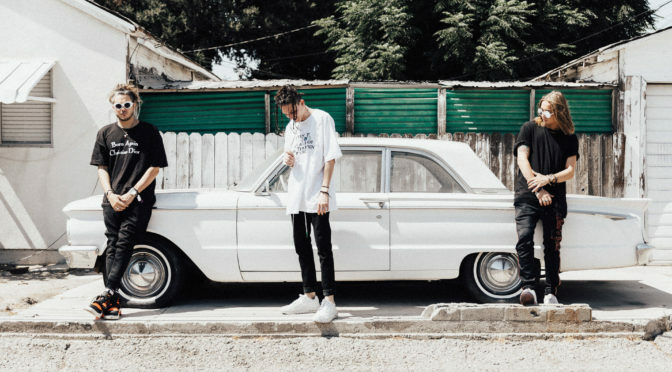 Los Angeles, CA – Australian three-piece, Chase Atlantic, has debuted their much-anticipated new single, “Like A Rockstar.” The offering is a solid, atmospheric alt-pop track that underscores the band’s eclectic sound and diverse musicianship. It also marks the group’s first release under their newly-inked partnership between MDDN and BMG. A forthcoming EP is slated for release in early 2019. Stream and download “Like A Rockstar” on digital retailers HERE. Comprised of brothers Clinton and Mitchel Cave, and their longtime friend, Christian Anthony, Chase Atlantic personally produce, perform, and passionately conjure up dark alternative pop, punctuated by rock and R&B that blurs the lines between a nocturnal aesthetic and primal bliss. Since forming in 2011, the trio has headlined shows worldwide, released their successful self-titled debut album (2017), as well as two independent EPs, Dalliance (2014) and Nostalgia (2015). In 2015, their single, “Friends,” went viral and caught the attention of Good Charlotte’s Joel and Benji Madden, who signed them to their music company, MDDN. Chase Atlantic has crossed over 80 million global streams on Spotify and Apple Music, racked up over 7.2 million total views on YouTube, and clocked over 1.1 million monthly Spotify listeners. The band has also built a strong following on social media, with 650k total combined followers across their platforms. In addition to touring with Blackbear, Sleeping With Sirens, and Lights, the group has played notable festivals including Lollapalooza, Bonnaroo, Firefly, Reading & Leeds, PukkelPop, Lowlands, and the final run of the Vans Warped Tour. Chase Atlantic is currently on a headline trek across Europe, with a full itinerary of dates included below. In other impressive news, Chase Atlantic landed the front cover of Rock Sound Magazine’s August issue, and has also garnered critical acclaim in the media from the likes of Billboard, Alternative Press, Associated Press, and more.